The ANZ World Commodity Price Index pushed up 1.4% m/m in March, continuing the positive trend present since the beginning of the year. Firmer prices were recorded in the agriculture and forestry sectors but dairy once again provided the largest price lift. In annual terms the ANZ World Commodity Price Index is down 2.1% y/y, with the deficit gradually clawed back over the past six months. Further price increases are expected for the major export sectors in the coming months. 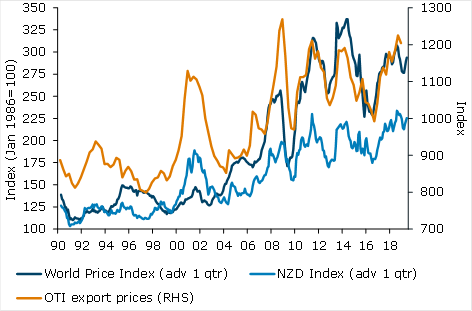 The NZD index also lifted 1.4% m/m in March, as there was little change in the average exchange rates across the month despite exchange rate volatility within the month.